Pancake Day is on the 16th February this year, and I have been busy making a few different kinds of pancakes for Morrisons. They sent me everything I needed to make and create some pancakes using seasonal ingredients, and to give their customers some new ideas for Pancake Day. I started with some American style pancakes - light and fluffy, they are the perfect pancake to serve with fruit, and are easy to make for breakfast. Hot on the heels of the American pancakes were some English style pancakes. 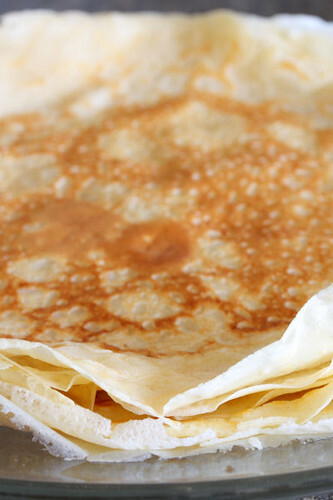 Us Brits love our thin, crêpe-like pancakes and these always appear on our table on Shrove Tuesday. We like them served simply, with lemon and sugar - straight from the pan, but you can also serve them with fruit or stuffed with a savory filling for a main course. Finely slice 200g of fresh rhubarb and gently fry it in 1 tablespoon unsalted butter. Add 50g of sugar and cook until the rhubarb is soft. Add some of the cooked rhubarb to the American pancake mixture and stir it in. Make the pancakes and serve with the rest of the cooked rhubarb. To the American Pancake mixture, add 2 teaspoons of ground ginger, 1 teaspoon of ground cinnamon and replace the caster sugar with brown sugar. For the pears, peel and slice 2 pears and saute them in a frying pan with 75g of butter for half a minute or so. Add 225g of soft brown sugar and 140ml of double cream to the pan. Bring to the boil and remove from the heat when the sugar has melted. 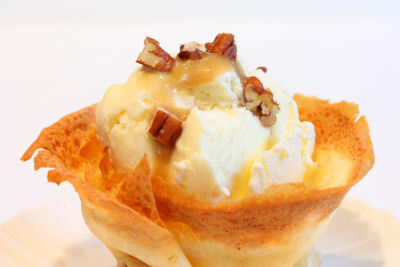 Serve with the spiced gingerbread pancakes and top with some chopped roasted pecans. My mum used to make us grilled grapefruit with brown sugar for breakfast when we were little, and this recipe idea is based on that. Peel and segment a grapefruit, placing the drained segments into a small baking tray that has been lined with non-stick foil. Top the grapefruit with a couple of tablespoons of brown sugar and place under a hot grill for a couple of minutes until the sugar is bubbling. 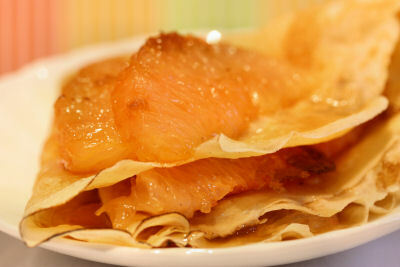 Place the grilled grapefruit onto the pancakes and fold them in half, and half again. Spoon some of the juices over and serve. I saw this nifty idea over at the Food Network site and couldn't resist trying it out. Take one of the British Style Pancakes and fold it in half, then press it into a muffin tray to form a little cup. Bake in a hot oven for 5-10 minutes until slightly crispy around the edges, keep checking to make sure they don't get too brown. 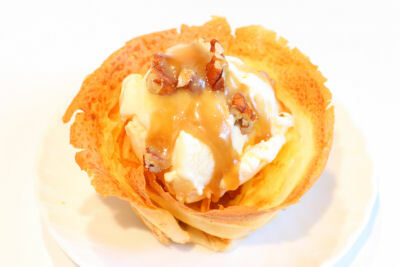 Remove from the oven and put a scoop of vanilla ice cream into the cup, then drizzle with caramel sauce. You can use different flavours of ice cream and sauces, I bet the rhubarb sauce would be good as well. I prefer to use an old, well seasoned, heavy cast-iron pan that is used only for pancakes. It's easier to pour the mixture from a jug, rather than ladle it into the pan. That way you can swirl the pan with one hand, while pouring the mixture in with the other, and you get really thin pancakes. Makes about 10-12 x 8" pancakes. Sift the flour and salt into a large mixing bowl. Make a well in the centre of the flour and break the eggs into it. Then begin whisking the eggs – I use a wire whisk – incorporating any bits of flour from around the edge of the bowl as you do so. Next, gradually whisk in the milk, don't worry about any lumps as they will eventually disappear as you whisk. When all the liquid has been added, scrape any bits of flour from around the edge of the bowl into the centre, then whisk once more until the batter is smooth, with the consistency of thin cream. Now melt the butter and spoon 2 tablespoons of it into the batter and whisk it in. Use the rest of the butter to smear on the pan, using a bit of kitchen paper or a silicone brush. I pour the pancake batter into a jug and use that to pour it into the pan, or you could just use a ladle to pour the mixture into the pan. Get the pan really hot, then turn the heat down to medium and, to start with, do a test pancake to see if you're using the correct amount of batter. Using either the jug or ladle method, pour the batter into the pan and swirl it around from side to side to get the base evenly coated with batter. It should take only half a minute or so to cook; you can lift the edge with a palette knife to see if it's tinged gold as it should be. Flip the pancake over with a heat-proof spatula or palette knife – the other side will only need half a minute or so – then simply slide it out of the pan on to a plate. 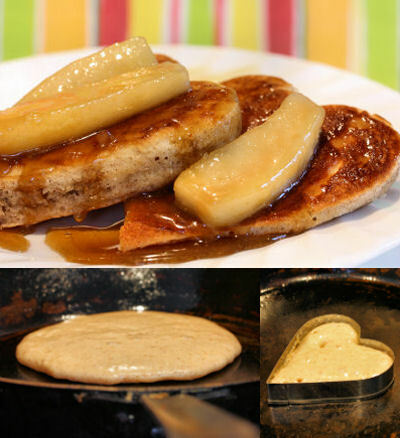 I like to serve these as I am making them, or you can stack the pancakes on a plate and keep warm until ready to use. An easy, fast recipe that you can adapt by adding flavourings, spices or a handful of oats if you wish. Makes about 8 small pancakes. Whisk the egg in a large bowl, using a wire whisk. Add the milk followed by the flour, baking powder, sugar, the pinch of salt and whisk everything together. Finally add the melted butter and whisk again. Heat and brush a non-stick frying pan with butter. Ladle about 2-3 tablespoons of the pancake batter into the pan. 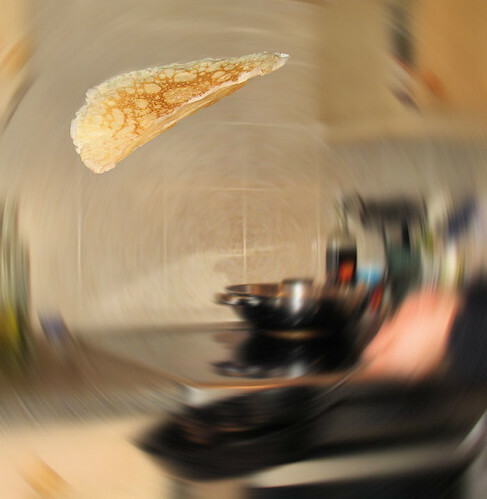 When you can see tiny bubbles on the surface of the pancake and the underside is nicely browned, flip the pancake over and cook the other side. Repeat with the remaining batter until all the pancakes have been made. On the Morrisons website there is a large database of recipes to browse, including recipes for pancakes and healthy eating tips. From last year, tossing pancakes. A nice reminder of pancake day coming! All these pancakes look lovely! I like savoury pancakes too! Waw!! What georgous & tasty pancakes recipes!! How to choose, dear friend? You have done Morrison's proud Nic. I love all of your ideas and they are very innovative too. Your pancake recipes are all great, I like how you've added different ingredients into the batters to flavour them. Love the pancake baskets too. Look out for my Morrison's pancake recipes on my blog in a week or so. Bow to you Nic, you are indeed the pancake queen. Lovely assortment!! I keept saying, right, this is the one...until I reached the next! I love the way your mother served them when you were young! And love the FN idea too...but in the end, I LOVE THEM ALL! haHA--i remember that stellar pancake pic. so impressive. Sho new there were so many ways to enjoy pancakes in different countries. I LOVE pancakes!! American, British, French ... I'm not fussy so long as it is a pancake. Going to give the rhubarb ones a try ASAP. What a lot of lovely looking pancakes! Ps: I love that picture from last year (you are so tricky with that camera)!! Some great ideas there, Nic. Not sure which appeals the most - they all tempt me! Like the idea of the grapefruit with brown sugar, though - not a combo I've come across in this context. Love the variety.....they look yum too. I love the pancake cups! They are so cute and creative. That's an idea that will have me thinking all day. Thanks for the reminder about Pancake Day. I can't believe Shrove Tuesday is jut a couple of weeks away. ready about all of these pancakes I practically wanted to take a bit out of my computer screen! And gingerbread pear oh yum! Great post! 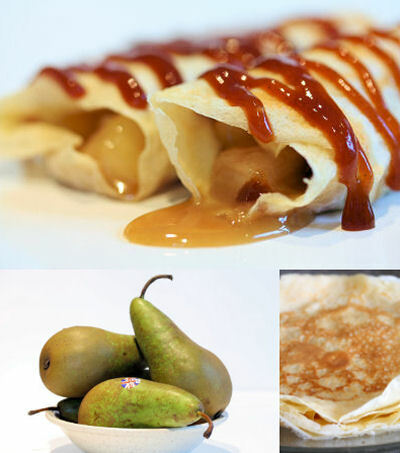 These are some great different way of having pancakes. I like using american pancake batter, with a bit of ground cinnamon, honey and grated apple. 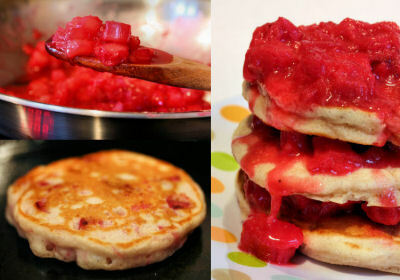 Rhubarb pancakes? Oh, bring 'em on. And I'm still mesmerized by the picture. It's one of the coolest ever! Those are excellent ideas Nic and I do remember the last year tossing of the pancake. I usually make the ones that are more like a fritter (made with yeast), fried and drizzled generously with syrup. Can't wait to make some next week. Sugar High Friday #60 : Holiday Edition Round-Up!